When I am counseling with children and families, I often incorporate a variety of multi-cultural traditions into expressive play and art experiences. After all it is a multi-cultural world, and kids with open hearts and open minds have the best chance of finding success and happiness. These activities can give new perspective and strengthen your own existing family traditions. Chinese New Year is the time when Chinese celebrate with big family gatherings, exchanging gifts and traditional customs. It is celebrated as a festival that lasts nearly two weeks. It is usually observed during mid January to mid February, according to the lunar calendar. In 2013, Chinese New Year will be observed February 9 through February 24. A special high light of Chinese New Year celebrations is the preparation of the ‘Chuen-hop’ or Tray of Togetherness. The tray is typically in the shape of an octagon and is filled with an assortment of foods like sugared fruits, coconut, winter melon, water chestnut and lotus seeds. The tray is offered to guests with the purpose of wishing them sweet beginnings for a new year. Each food symbolizes a positive message that is sent out into the world also ensuring a sweet future for your family. In the counseling session I provide the family with an octagon shape, cut out of red construction paper, or poster board. The family talks about what wishes, or sweet beginnings that their family would like to send out into the world and writes them on the poster board. The family then discusses ways in which their family (through their own behavior, or acts of kindness) is continuing to send these wishes out into the world. The family is encouraged to take their Tray of Togetherness home and display it in a place of honor as a reminder of what they want to give to the world in the coming year. Perhaps your family would enjoy taking part in this Chinese New Year Tradition and spend an evening creating your own tray. At Novell& Novell Counseling we have created our own Tray of Togetherness as a way of sharing our wishes for each of you and your family. Sweet Beginnings For a New Year! Gung Hay Fat Choy! 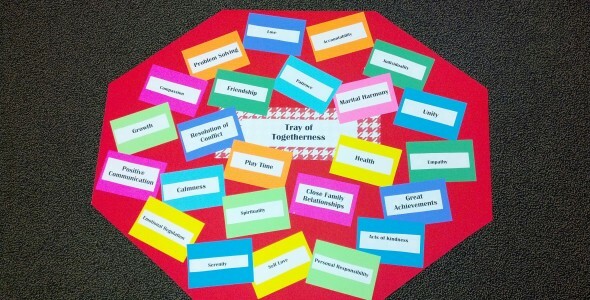 You will find our Tray of Togetherness hanging in the lobby. While you are there don’t forget to pick up a lollipop and have a sweet treat too! Janelle Novell is co-founder of Novell and Novell Counseling Services. She is a Licensed Marriage and Family Therapist and a Registered Play Therapist-Supervisor who works exclusively with children ages 2-12. Play Therapy is a form of counseling or psychotherapy that uses play to communicate with and help people, especially children, to prevent or resolve psychosocial challenges. To schedule and appointment with Janelle or any other therapist, please call 951-252-9911.